One of the most competitive and compelling seasons in the 40 year history of American Motocross came to a fitting conclusion this afternoon at the Traxxas Pala National in California, with Ryan Villopoto overcoming one more small contribution of drama to claim the Lucas Oil AMA Pro Motocross Championship in the 450 class. His title rival Ryan Dungey claimed the 450 overall win via 2-1 scores, but both he and Villopoto had to overcome bad starts in both motos, and race it out for a championship while coming through traffic, which only made the race more exciting. The 250 class was fun to watch, as well, with Dean Wilson winning two close races to go 1-1 and win the overall, a cap on his 2011 250 Championship campaign. The 450 Championship captured much of the attention coming into the day, with Villopoto holding a 14-point advantage coming in. That's a sizable gap, but a big mistake could have swung the title to Dungey. And then things immediately turned crazy in moto one when TwoTwo Motorsports Bel-Ray Racing's Chad Reed bumped both Ryans off the start, and a few seconds later Reed went down in the first turn. 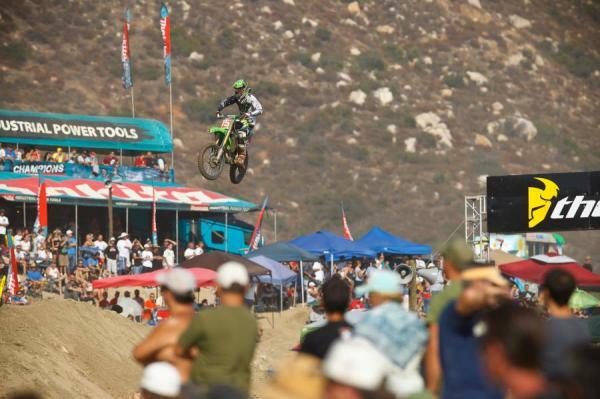 Both Villopoto and Dungey ended up way back, and early on, Villopoto made the type of mistake Dungey was looking for. Villopoto landed so hard off of a jump that his right hand came off the bars. 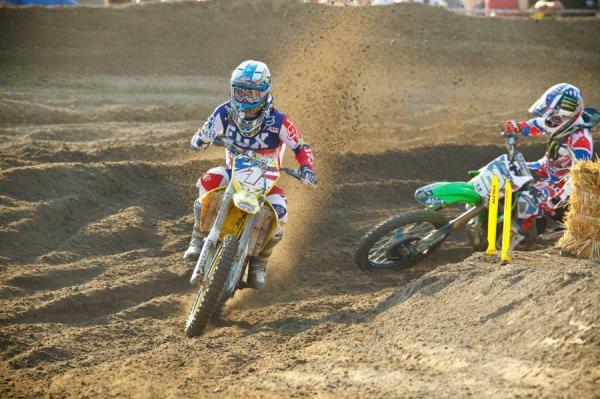 He was side by side with Dungey at the time, and Dungey even gave a look to see if Villopoto was able to hold on. He did. 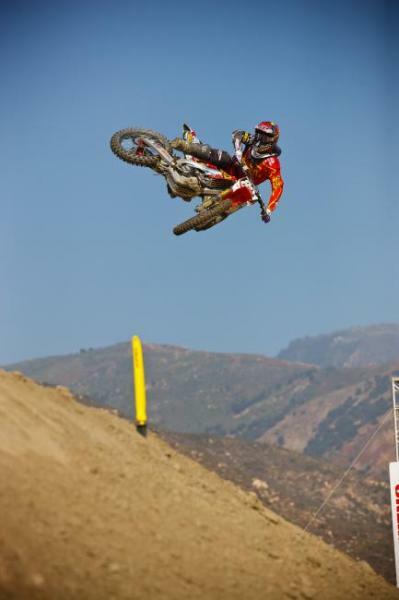 They continued their march forward while Red Bull KTM's Mike Alessi led American Honda's Justin Barcia. Barcia then passed Alessi to snag the lead. Villopoto and Dungey passed each other back and forth a few times, with Villopoto finally locking down second and then going after Barcia. Late in the race, he made the move for the lead, and with two laps to go Dungey made the pass on Barcia as well. Dungey charged hard to the end, but came up short on Villopoto, who won the moto and extended the lead to 17 points heading into the final moto. In both motos, Dungey (1) and Villopto stayed in close formation while fighting through the pack. 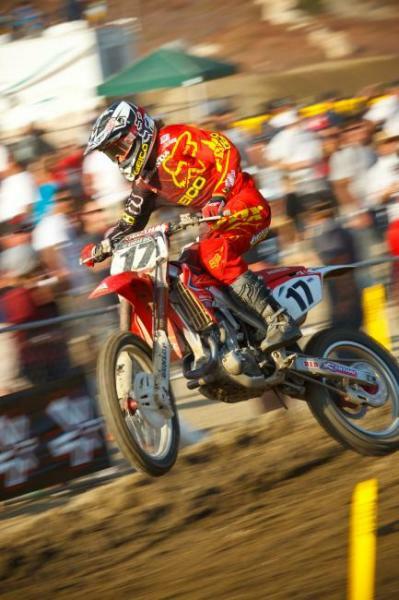 Note the Motocross of Nations graphics and gear on the Team USA riders. Villopoto could have cruised, but he won the first moto to take a step close to the title. A first-turn crash hurt Chad Reed in moto one, but he led several laps in moto two before another small crash. They got bad starts in the second moto, too, while this time Reed jumped out front along with Muscle Milk Toyota JGR's Justin Brayton, and Barcia. It appeared the two Honda riders, Reed and Barcia, were set to go 1-2 while the Ryans had to battle through traffic again. But Reed fell while leading, handing the top spot to Barcia. Dungey then passed Reed to take over second, and Villopoto followed him through to third. With Barcia leading, he held the overall win with 3-1 scores, but with two laps to go, Dungey pushed the pace even harder and was able to reel in the Honda man to take the lead before the white flag came out. With that, Dungey was set for a 2-1 overall win, while Villopoto locked down the title with 1-3 scores, with Barcia rounding out the podium--after coming within two laps of the overall win. Reed fell while leading the second 450 moto, leaving Barcia in the lead to collect the overall. He came within two laps of getting it. 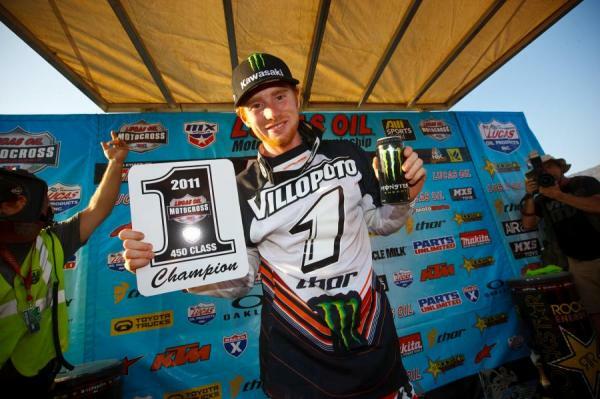 Villopoto with another number one plate. In the WMX class, American Honda Racing's Ashley Fiolek claimed her third career championship by staying smart and consistent, while Jessica Patterson swept both motos, but came up short of defending her crown. Dean Wilson and Blake Baggett put on a superb first moto battle. 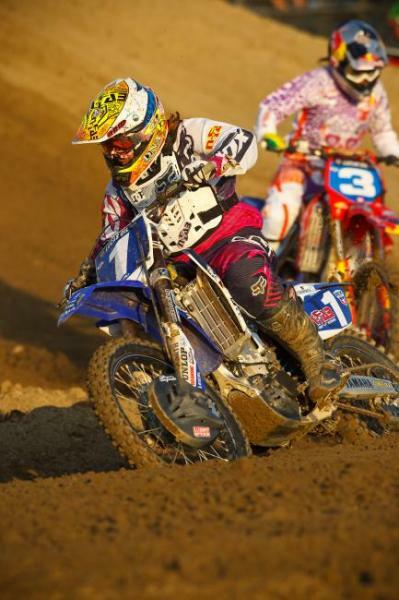 Ashley Fiolek claimed her third WMX crown in four pro seasons. Jessica Patterson scored a 1-1 overall win but had to hand over her number one plate. 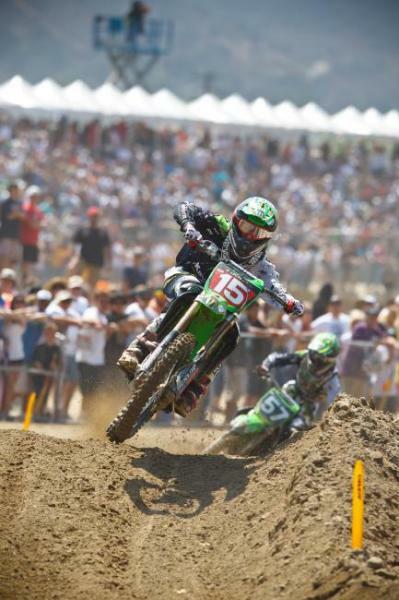 In 250 action, the Monster Energy Pro Circuit Kawasaki team continued their season of dominance. Blake Baggett grabbed the early lead in moto one, but Wilson made an early pass on him. 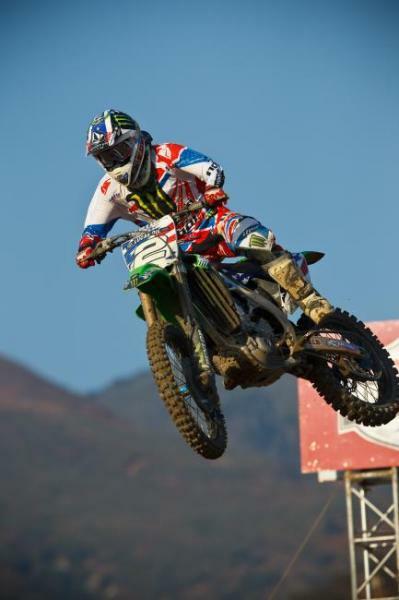 Tyla Rattray went past Baggett as well, with Marvin Musquin close behind in fourth on a Red Bull KTM. But in the second half of the race, Baggett began to show flashes of his early-season speed, passing Rattray back and closing back in on Wilson. They engaged in a great battle for the lead down the stretch, but Wilson held off repeated pass attacks from Baggett to take the moto win by just one second. After the race, tempers flared as Baggett took issue with Wilson. He claimed Wilson cross jumped him, and they argued after the race. In the pits, Team Owner Mitch Payton quickly calmed his boys down and declared the fued was over. They never got a chance to battle in moto two. Instead, GEICO Honda men Jimmy DeCotis and Justin Bogle got out front. Wilson moved up to second, but Bogle held the lead late, with Wilson finally getting by around the 25 minute mark. Bogle rode hard to the end, and he had to, with Bagget overcoming his bad start to get to third and nearly run him down. But Baggett ended up third, good enough for second overall. Musquin's 4-4 made him third for the second-straight weekend. Rattray's 3-5 allowed him to edge Baggett by just three points for second in the championship. Another close battle came next, with Eli Tomac overcoming rough starts to salvage ninth overall, and edge Kyle Cunningham for fourth in the final standings by three points. 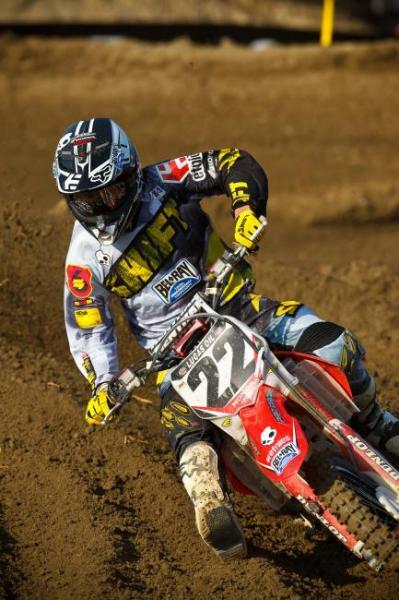 New pro Justin Bogle nearly won the second 250 moto. Wilson made big leaps look easy on his way to a win. Pala Raceway - Pala, Calif.